For those like me whose northern city life renders us absolutely clueless in the jungle, we are saved by the grace of an amazing and knowledgeable staff at Piro and Greg Gund who can transform the ghouls of the night into adorable, fluffy, and endlessly fascinating animal life. Thankfully Manuel Sanchez did this for me when he led me by flashlight to confront my forest bruja, a Common Potoo! 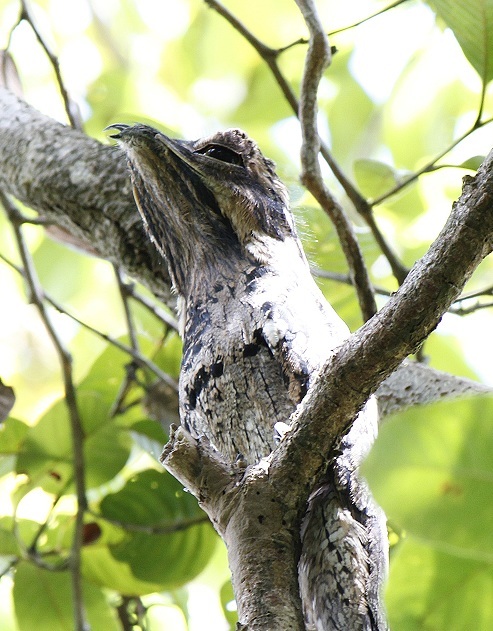 The Potoo, or “pajaro estaca” as it is locally known (Nyctibius griseush) is a nocturnal, insect eating bird that is related to the nightjar. It is nearly impossible to spot during the day as its coloring camouflages it brilliantly with the protruding upright branches or fenceposts upon which it normally sits. The bird’s large, glowing yellow eyes and unique call are usually what give away its nighttime hunting perch. While listed by IUCN as a species of least concern, this bird is not commonly spotted in Osa. We are very lucky (and I think our conservation birding trip participants will agree) to have a couple of them that return every year at the same time to the same two trees at Piro, one on the property adjacent us and one at the forest edge near the entrance to the Terciopelo beach trail. The Potoo is quite a site to behold with its ruffled, upward stretching head and drowsy expression. So, if you are lucky enough to spot or at least hear this forest witch at night, don’t worry, its friendly (as long as you’re not an insect)! This entry was posted in Birds and tagged Birds, callings, jungle, osa, Peninsula, Potoo, sighting. Bookmark the permalink.